Peloton Technology: The firm wants to save trucks money by helping them drive in bicycle race formation. And why a Silicon Valley firm thinks that will save them money and gas. 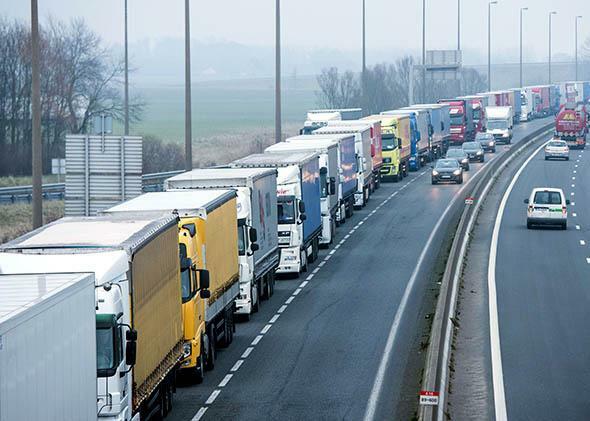 Imagine this formation at full highway speed: Trucks sit in an emergency lane leading to the port of Calais, northern France, on Jan. 22, 2015. If the Obama administration gets its way, trucks are about to work a lot harder to fight global warming. As the New York Times reported just over a week ago, the Environmental Protection Agency may push trucks, which account for about 25 percent of vehicles’ greenhouse gas emissions, to make significant improvements on their current, pathetic fuel consumption of 5 to 6 miles per gallon. * Trucking companies will likely object strenuously, even though they stand to gain financially from using less fuel. Upgrading the nation’s truck fleet will likely require significant investments in new materials and technologies, of course. But the industry may be able to get at least part of the way there simply by driving existing trucks more efficiently. Last month I wrote about GreenRoad, an Israeli company that uses software and gamification to encourage bus and truck drivers to go lighter on the accelerator and brakes, thus increasing fuel efficiency by about 3 percent. Now a company in Silicon Valley is promising substantially greater gains by stealing an idea from the world of competitive bicycling. When a rider in a bicycle-race peloton drafts—that is, when he rides with his front wheel right behind the back wheel of the guy in front of him—he save lots of energy and effort because the lead rider absorbs a lot of the wind resistance. In theory, the same principle could apply to trucks on the highway—if they were to travel really close to one another, say, between 35 and 50 feet apart. The problem is that because of the speeds at which they travel, and the slow reaction times of the humans who drive them, trucks are supposed to stay about 200 to 250 feet apart on the highways. Enter Peloton Technology, a nascent firm founded by Josh Switkes, a Stanford engineering Ph.D. who, like many in Silicon Valley, is a bicycling enthusiast. “I ride when I have time, a couple of hundred miles per week,” he says. But his eureka moment didn’t come when he was tearing through the hills around Mountain View. Rather, Switkes, who had worked for Volkswagen and a powertrain startup, recalls being struck several years ago by the fact that U.S. trucking firms spent $100 billion a year on diesel. At the time, he says, the entire Internet advertising industry in the U.S. was $60 billion. “In the U.S., more money is spent on diesel fuel and trucks than on the entire Internet,” he says. Then he did some math. A single truck might spend between $80,000 and $100,000 a year on fuel. Fuel accounts for about 40 percent of the costs of running a trucking fleet, and fleets run on thin margins, of about 2 or 3 percent. “If you could save trucking fleets a couple of percentage points on their expenses, you can potentially double their profits,” Switkes says. Now, drivers in passenger cars are supposed to maintain a safe distance of 100 to 150 feet, or the amount of distance a car covers in about 1.5 seconds. But trucks generally abide by a three-second rule, in part because their air brake systems take a little longer to engage. Switkes wondered if technology could enable big trucks to speed down the roads like bicyclists, reacting instantaneously to changed conditions, and save money in the process. The technology exists. Vehicles of all sizes are equipped with sophisticated sensors and radar that enable adaptive cruise control and other collision-avoidance features that automatically hit the brakes, accelerate, or steer to avoid other objects in motion. Peloton, which was founded in 2010 and is in testing mode, augments such systems with a second component—vehicle-to-vehicle wireless communication. The government has set aside a band of spectrum called dedicated short-range communications for vehicle safety applications and wireless car-to-car communications. In a few years, Switkes notes, virtually every passenger car made in the U.S. will contain a DSRC radio, which will continually broadcast a vehicle’s speed of travel and pace of acceleration. Peloton’s idea is to install equipment that lets trucks communicate wirelessly and thus sync their collision avoidance systems. Two trucks on the road could then pair up, driving 36 feet apart, all while constantly communicating information about speed. When the truck in front hit the brakes, the truck in back would automatically slow down as well, without the need for driver action. A screen in the following truck would allow the driver to see out the front window of the lead truck. “It’s more like a tandem than a peloton,” Switkes allows. Does it work? Switkes says trucks have platooned about 14,000 miles without incidents. They have done so on closed tracks, like the Continental Tire Uvalde Proving Grounds in Texas. And they have done so on the open road. In November 2013 the North American Council for Freight Efficiency ran a test on a stretch of Interstate 80 west of Salt Lake City. Two 2011 Peterbilt 386 trucks, owned by trucking firm C.R. England and equipped with Peloton’s technology, were paired up and drove six segments of about 40 miles each, hauling trailers fully loaded with pallets—at 64 miles per hour, just 36 feet apart. “There were times when it felt really close,” Mike Roeth, executive director of NACFE, who rode in both the front and rear trucks in the test, tells me. But it worked. According to NACFE’s report, the back truck improved its mileage by 10 percent while the front truck showed a 4.5 percent improvement. Why? Aerodynamics. Having a truck drive directly behind you helps reduce the wind resistance trucks encounter across their flat rears. So how does Peloton propose to make this a business? The company, which has raised venture capital from investors including transport companies like Castrol, UPS, and Volvo, proposes to charge a small hardware fee for installation and then would bill clients by the number of miles they drove while platooning. “The beauty of this is that fleets don’t have to put up a lot of capital, and only pay us based on their savings,” says Switkes. The technology seems to work. “I think technically we’re talking about something that is real capable here,” says NACFE’s Roeth. But turning this into a business faces some obstacles. Police may look askance at massive trucks speeding down the highway in such close proximity. And while some fleets commonly dispatch more than one truck at the same time along the same route, most travel solo. The idea is that if enough drivers adopt the system, Peloton could pair a user up on the road with another Peloton user—like two lone cyclists, deciding to make common cause on a long straightaway. *Update, June 8, 2015: This sentence was revised to clarify that that trucks account for 25 percent of vehicles’ greenhouse gas emissions, not all greenhouse gas emissions.